A few weeks ago we held had our annual trip to see several Broadway shows. 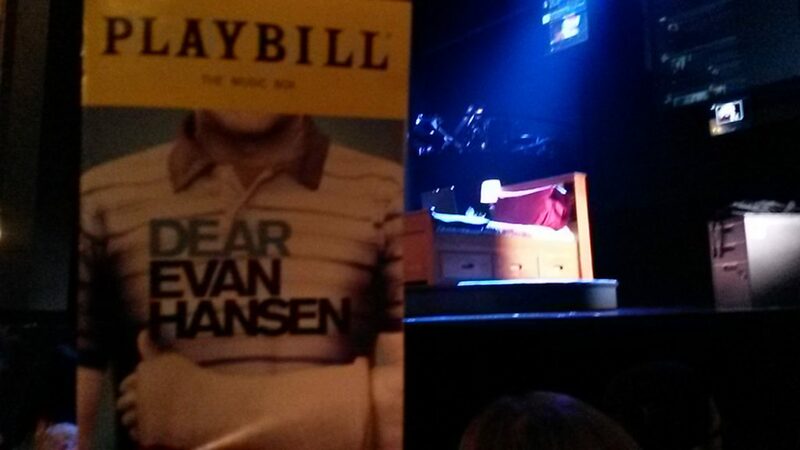 This is a review of the lighting, sound, and tech for “Dear Evan Hansen” at the Music Box theatre. I’m not going to review the overall show – there are many reviews of the story and show. This is a review of tech aspects, with just a few comments about the show. Loved the music and story was interesting. Outstanding acting, especially the “ticks” that Evan Hansen was exhibiting. But this review is about the tech so lets move on…. The story is closely connected with social media, so the entire pre-show consisted of bleeps, beeps, and other cell phone notification sounds. Very creative, but it did get tiresome after about 10min. If you arrive early to the show, the 25 or so minutes of notification sounds was almost annoying. The pit was on stage, setup on a deck above the main stage floor. Pit volume was appropriate for the show. Based on where our seats were (orchestra right, a few rows from the stage) and a lack of front fill speakers, the vocals were too quiet compared to the pit. I don’t blame pit volume – it seemed right. But we were only getting live vocals (no sound reinforcement) from the actors, so some dialog was challenging to hear. Not sure why there were no front fill speakers. It’s my only real criticism of the sound. There were two late mic cues, which I find refreshing to know that there are humans behind the console. Outstanding lighting by Japhy Weideman. Maybe better than Next to Normal which is my high water benchmark. There was excellent, smoothly crafted layering, and cue flow was perfect. Most cues were were well motivated, appropriately subtle when needed, and big/bold when it added to the music or story telling. I keep coming back to how Next to Normal handled the very smooth cue flow, again except when big/bold strokes were needed. There were two follow spots on box torms which created good layering and helped avoid issues with the scrims that often had video projections on them. There was one interesting issue between lights and one actress’ makeup. This actress was an understudy playing Heidi. The makeup looked cold and pasty, not the warm natural facial tones of all the other actors. The actress was clearly talented, so I’m not sure why the difference was so noticeable, other than since she was an understudy, the makeup choice was just an accident. And I typically don’t notice makeup. A nice small touch was use of LEDs in laptops to simulate the screen shine on the actor’s faces. They provided an ideal, easily seen cold light. Slightly overstated from normal, but this would be easily seen from all seats in the house. A smart decision, not too unlike how most of us use a dark blue for night on stage, so we can still see the actors bodies. This was well done, and totally supported the use of computers as part of the social media character. The show depends heavily on scrims and screens to convey social media, which served as it’s own character. Four projectors mounted on the balcony rail were providing imagry of texts and similar on several tall scrims. The scrims were at and upstage of the curtain line, a little wide of center. The crafting of back light and front light was exceptional, providing a perfect interplay between projections, screens, and lighting. This entry was posted in General Interest, Lighting Technology, Music Technology, Theatre Technology and tagged broadway, Dear Evan Hansen, General Interest, laser technology, lighting console programming, lighting design, lighting technology, music, Music Technology, theater, theater lighting, theatre, theatre technology. Bookmark the permalink.